We never manage to bury the dead completely. Their words still echo down to us from beyond life’s event horizon in direct contravention of physical law. Our stance towards death is a determining factor in how the dead return to us; in what form and with what significance they haunt the living. Although they are always there, the ways in which they interact with us vary and shift through time. And, at the present time, there is a strange blend of residual religious funerary rites and atheistic materialism. It feels very much as though we go through the motions of dispatching the dead to the next world without believing a word of it. But, whether we believe it or not, the dead continue to return as they always have and always will. The dead return to us as memories, dreams, reflections; but also as theological dogmas, ideologies, and ghosts. For most of human history we have managed to understand this and to organize our lives so as to accommodate the presence of the dead. It is a peculiarly modern conceit that consigns the dead to a zone of absolute nothingness and unbeing, and this despite the ubiquity of images of the dead in literature and film. It seems that we can only confront death through the prism of entertainment, safe in the knowledge that ghosts are firmly confined to a fictional world. But there is nothing really entertaining nor fictional about death; not as it actually is. It is a very real legacy and the one imminent destiny. built a great mound and they put in a door and three windows. And when Freyr was dead, they carried him into the mound in secret, and said to the Swedes that he still lived, and they kept him there for three years . . . When the Swedes all realized that Freyr was dead but the harvests and peace continued, then they believed that it should be so while Freyr was in Sweden and they did not want to burn him, and they called him the World-God, they sacrificed mostly for harvest and peace ever since. There are two important things to note about this account of Freyr. Firstly, he was the World-God. This status is confirmed by the Skirnismal in which Freyr is said to sit on the high throne Hlidskjalf which grants omniscience, and which later becomes Odin’s throne. Secondly, the Swedes decided not to cremate Freyr as was traditional at the time, but to leave his remains in the burial mound. This marks the beginning of ritual inhumation. The belief that the power of the god to provide peace and good harvest would continue after his death is linked to his continuing presence in the burial mound. These funerary monuments stand in place of the departed and continue to exert the power and influence of the dead over the living. As Freyr (and later Odin) sat on Hlidskjalf and gained knowledge of all nine worlds, so the king could sit on the burial mound and gain knowledge and authority from the other world. The use of the burial mound as a means of sanctifying the king’s authority seems to have been long lived. As late as the English Civil War, King Charles I was said to have addressed his troops from a burial mound next to Rykneld Street. Clearly, we have certain residues of ancient burial practices that are connected with ideas of ancestral authority and power. Whilst there may be some ambiguity concerning the place of inhumation burials versus cremation, there is no real paradox to the deeper meaning behind these practices. In the account of Freyr’s death, cremation is abandoned as a practice because the Swedes believe that his continuing presence in the mound is responsible for their ongoing prosperity. In the tradition of cremation, the passage through fire indicates a transformation to an otherworldly status. In both cases, it is the continuing presence of the dead that is a common factor. Whatever local variations in practice may have occurred, it is clear that these funerary practices point to the ongoing agency of the dead in the affairs of the living. The coming of Christianity necessitated a significant change in understanding. The new religion forbade cremation and insisted that the dead remained with God in heaven. This metaphysical screen that shut the dead off from the living also initiated a moral bifurcation in the Germanic mind. In line with the ideological program put forth by Pope Gregory of maintaining the places of heathen worship whilst replacing the idols with Christian icons, many churches were built at the site of burial mounds. This was an appropriation of a numinous site by the new religion with the intention of maintaining the numinous force but redirecting it to Christ. In this new metaphysical scheme there could be no place for revenants of the ancestors remaining as connections with the otherworld. But this did not eradicate the belief in ghosts. What seems to have happened is that the burial mounds on the outskirts of communities became places of execution and burial grounds for criminals. As such places, which were often on borders and crossroads, became more extraneous to the community so the spirits associated with those places became more demonized. In this way, the burial mounds that were chosen for appropriation by the Church continued to exert numinous power through the context of Christian worship, whilst those that were abandoned became unconsecrated ground associated with evil, and the numinous power emanating from them expressed itself in the form of demonic and terrifying spirits. So, not only did the conversion distance us from the ancestors, it also initiated a new hierarchy of the dead. Whereas previously immortality was won through deeds and honorable living, with Christianity all that was needed was a profession of faith in Jesus Christ. This democratization of death created a new distinction between those who belonged to the new religion and those who did not. This distinction was more important (to the Church) than the traditional bonds of familial attachment, although in practice it seems that there was a stubborn clinging to the old ways as the practice of burial with the ancestors continued for some time after the conversion despite the fact that the ancestors were “heathen.” In this context, those ghosts that interacted with the living would have increasingly been seen as evil and demonic entities barred from heaven, condemned to a purgatorial misery of quasi-corporeality, whilst the ancestors would have been residing with Christ in heaven, distant and incorporeal. It is from this bifurcation of the dead into incorporeal saintliness on the one hand, and bodily ghostliness on the other, that we derive our modern conception of the ghost. Bearing this in mind, it is possible to see the birth of the contemporary understanding of the ghost as being part of a greater tradition. 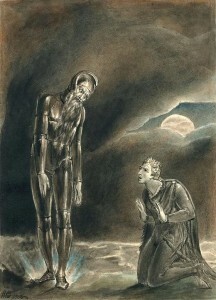 If the modern conception of the ghost seems to begin with Shakespeare’s depiction of the ghost of Hamlet’s father then it is certain that Shakespeare was drawing on other traditions that were themselves already ancient. It is widely known that in writing Hamlet Shakespeare was drawing on an existing play, the so-called Ur-Hamlet. This Ur-Hamlet in turn was based on an account of Amleth given by Saxo Grammaticus in his twelfth century Gesta Danorum. In Saxo’s version, Amleth returns from England and carries out a planned revenge on Feng, his stepfather and the killer of Amleth’s father. When Feng and his men are asleep in the hall after a drunken feast, Amleth throws a wall tapestry over them and secures it to the floor so that they cannot escape. He then sets fire to the hall killing everyone trapped inside. Following this, Amleth is installed as the rightful king and initiates a reign of peace and prosperity. Shakespeare erases most of the mythic content by making Hamlet doubt himself so that he cannot become the king of a new era. This “humanist” interpretation of the material is what makes the play seem as though it belongs to a properly modern audience but the source material indicates that there are genuinely traditional motifs at work here. With or without theological endorsement, in other words, the walking dead continued to haunt the popular imagination. In Why Shakespeare? I put the case that the plays owe more than we have acknowledged to the tradition of winter’s tales. These, rather than the officially sanctioned purgatorial narratives of the Catholic past, seem to me a more probable source of Shakespeare’s ability to meet – and perhaps exceed – the expectations of his audience when it came to the introduction of a ghost. Old Hamlet does not request prayers for his soul: instead, he wants revenge, a demand for gratification scarcely likely to increase his chances of salvation. It is tempting to read this blending of traditional forms with individual innovations as an incipient form of post-modernism. But acting against this reading is the eerie fear evoked by the ghost. This uncanny feeling that is aroused by the sight of the walking dead cannot be reduced to one single component interchangeable with many others. It is not a mere signifying motif. Instead, the dead king brings an existential dread not just to Hamlet but also to the audience who are subliminally reminded of atavistic belief systems; of undead primordial revenants that lie dormant beneath the veneer of modernity. 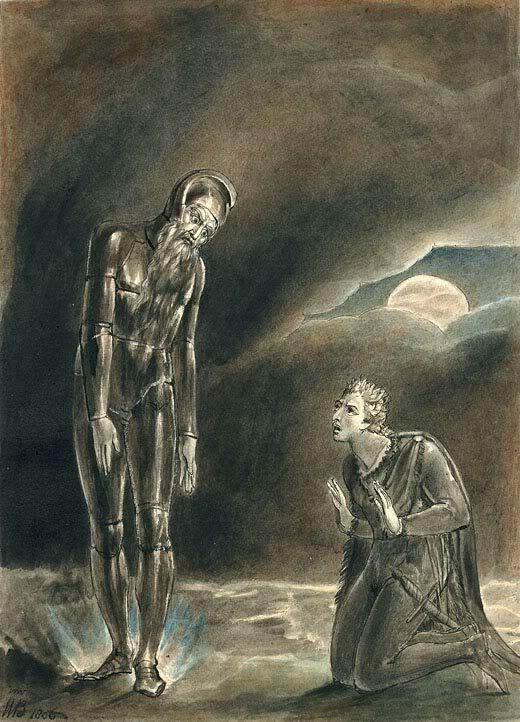 On the one hand, the ghost in Hamlet is a huge step forward from theatrical conventions of the time which, in the manner of the morality plays, would depict posthumous characters as embodiments of single moral qualities (Folly, Conscience, Good Deeds, etc.). His very humanity accentuates the liminal tension of his alive/dead status. On the other hand, and as we have seen, the ghost also points back to more ancient notions that precede the moral imperatives of Christianity. On one level, he is the ghost of heathen belief that was supposed to have been laid to rest once and for all many centuries earlier. If the spirit of Hamlet’s father marks the beginnings of the modern literary ghost, then M. R. James undoubtedly marks its apotheosis. James’ short stories articulate the modern ghost story proper, and it is notable that in this telling the ghost has lost his patriarchal role completely. What James expresses is the sense that the dead, insofar as they continue to haunt the living, are completely other. The sense of the uncanny, which teetered on a knife edge in Hamlet, has now firmly resolved itself to perceive the dead as wholly distinct and, in fact, repulsive. The ambiguity arising from the ghost’s dual status in Hamlet, as both father and specter, both upholder of the right order and yet disrupter of the metaphysical order (between life and death), has now disappeared. The ghosts in M. R. James’ stories are malevolent spirits tied in some way to a particular place, condemned to repeat autonomic patterns without a recognizable human agency. In James’ most famous tale, “Oh, Whistle, and I’ll Come to You, My Lad,” a young professor holidaying on the English east coast carries out a preliminary survey of a ruined site once belonging to the Knights Templar. In a small cavity he finds buried a bronze whistle. The whistle bears a fragmentary Latin inscription translating as “who is this who is coming?” Blowing the whistle rouses the ghost who pursues the young professor in a dream sequence. The ghost is incorporeal, being given form by “pale, fluttering draperies, ill-defined.” When the ghost is finally confronted in the flesh (so to speak) its significant feature is its “intensely horrible, face of crumpled linen.” Its form deriving from a white bed sheet, this ghost is the exemplar of modern ghost stories. The bed sheet ghost had already become known on the stage. The fully corporeal ghost (Hamlet’s father is dressed in full armor) had become a clunky embarrassment as audiences came to expect something more ethereal and spooky from their ghosts. The etherealization of the ghost into pure spirit also marked the erasure of the ancestral linkage. These ghosts appeared less and less as recognizable dead relatives; instead they were increasingly cast as malevolent spirits, divorced from an embodied sense of identity. Clearly, this shift signals something of a crisis in our sense of lineage. With the rise of capitalism the final victory of the church’s universalizing mission was achieved. Authority no longer derived from the ancestors, from a hierarchy of social classes, but instead from the new democratization effected by money. Partly, this explains the passing away of the ghost as a recognizable forebear. Put simply, in the new social conditions brought about by capitalism the father’s role had been usurped by capital; he could no longer return from the dead to re-establish the correct order because his authority was already subservient to the existing order. Here we begin to sense how ghosts were increasingly becoming a mere force of malevolence, a disrupter of the metaphysical order but without a higher sense of order to justify their liminal intrusion into the rational world. What is anachronistic about the ghost story is its peculiarly contingent and constitutive dependence of physical place and, in particular, on the material house as such. No doubt, in some pre-capitalist forms, the past manages to cling stubbornly to open spaces, such as a gallows hill or a sacred burial ground; but in the golden age of this genre, the ghost is at one with a building of some antiquity, of which it is the bad dream, and to whose incomprehensible succession of generations of inhabitants it makes allusion as in some return of the repressed of the middle-class mind. Not death as such, then, but the sequence of such “dying generations” is the scandal reawakened by the ghost story for a bourgeois culture which has triumphantly stamped out ancestor worship and the objective memory of the clan or extended family, thereby sentencing itself to the life span of the biological individual. No building more appropriate to express this than the grand hotel itself, with its successive seasons whose vaster rhythms mark the transformation of American leisure classes from the late 19th century down to the vacations of present-day consumer society. The Overview hotel, the setting for The Shining, is an emblematic site for haunting in late capitalism. It perfectly represents the bland and sterile form of social relations that dominate in American consumerism and, additionally, it is a “home” without a recognizable lineage; all of its inhabitants are transitory and heterogeneous. For where the novel stages the “past” as a babel of voices and an indistinct blast of dead lives from all the generations of historical inhabitants in the hotel’s history, Kubrick’s film foregrounds and isolates a single period, multiplying increasingly unified signals: tuxedoes, roadsters, hipflasks, slicked-down hair parted in the middle. . . .That generation, finally, is the twenties, and it is by the twenties that the hero is haunted and possessed. The twenties were the last moment in which a genuine American leisure class led an aggressive and ostentatious public existence, in which an American ruling class projected a class-conscious and unapologetic image of itself and enjoyed its privileges without guilt, openly and armed with its emblems of top-hat and champagne glass, on the social stage in full view of the other classes. The nostalgia of The Shining, the longing for collectivity, takes the peculiar form of an obsession with the last period in which class consciousness is out in the open: even the motif of the manservant or valet expresses the desire for a vanished social hierarchy, which can no longer be gratified in the spurious multinational atmosphere in which Jack Nicholson is hired for a mere odd job by faceless organization men. When, in the novel, Jack begins to read the scrapbook he is struck by the weight of history the hotel brings with it and, more deeply, by the notion of history itself, “It seemed that before today he had never really understood the breadth of his responsibility to the Overlook. It was almost like having a responsibility to history. . . . Suddenly it seemed that he could almost feel the weight of the Overlook bearing down on him from above, one hundred and ten guest rooms, the storage rooms, kitchen, pantry, freezer, lounge, ballroom, dining room . . .” The caretaker’s inventory of the hotel’s interior is a nice illustration of the way in which the history of the Overlook begins to possess Jack. And, to be sure, this possession takes the form of a generalized sense of history imprinted and trapped within the labyrinthine structure of the grand hotel. Where Jameson’s analysis is most astute is in ascribing to The Shining (and particularly to the film version) the sense that haunting is essentially a process that becomes manifested externally through the “return of the repressed.” This does not mean that the ghosts should be read as mere psychological projections; the ghosts in both the book and the film of The Shining appear to have a solid physical manifestation. Rather, they are revenants without a home and consequently without an identity, and as such they represent the repressed fact of the erasure of the self under capitalism. No wonder that the closing shot of the film shows Jack Torrance’s doppelganger in an old photograph as though both men were simply interchangeable individuals without a greater contextualizing identity; in other words as though they were atomised individuals without families, which, effectively, is their fate as menial employees working under the profit driven imperatives of the hotel’s owners. Unlike the pure spirits of M. R. James’ tales these are fully present specters in a physical sense but there is still a void where their identity should be. The ghosts of The Shining are all too real but the solidity of their corporeal manifestation belies the ongoing erasure of authentic identity that continues apace in American life under capitalism. In The Shining the last vestiges of a recognizably European social order have already disappeared; its fragmentary emblems echo along the bland walls of the Overlook to sinister effect. But there is no sense within the text (or in the film) that the spectral inhabitants of the Overlook represent something to be admired, apart from within the psychotic mind of Jack Torrance. And it is here that Jameson overstates his case. Compelled to interpret The Shining through a Marxist prism he reads the 1920s ambience of the hauntings as a nostalgic yearning for a better world. But this lost world, as manifest within the Overlook, is malevolent and threatening. Certainly, Jack Torrance’s complicity with the simmering malice of the hotel is a type of identification with a world that has disappeared entirely; but the presencing of the dead in the Overlook is a wholly disjunctive procedure. The ghosts of the Overlook have only a contingent link to the place: they were killed there. There is no living connection with the site as a numinous location. Any sense of nostalgia for the dead world rattling away within the Overlook’s walls must reckon with the fact that it was already a rootless world. In this way, the dead are uprooted from their resting place and denied an ancestral burial. An atomized people without a home (in the fullest sense of that word) will be haunted by restive ghosts, wandering aimlessly, and senselessly repeating their actions: the onset of spectral dementia. the faithful and the Church Fathers did not realize that by destroying belief in ghosts, they were also taking away the basis of religion, which left it floating, detached from the ground that nourished it. Whoever no longer believes in ghosts has only to pursue his unbelief to its conclusion to realize that there is no being hidden behind things, no ghost or – what comes down to the same thing if one understands the word in its naïve sense – “no spirit” . . . With ghosts, we enter into the realm of spirits, of beings. Derrida also discusses the spectral nature of the commodity. Any object, as soon as it becomes a commodity, is haunted by a ghostly doppelganger that represents (or embodies) its exchange value. A spade has a mere utility value if it is never an item of exchange. But as soon as it becomes a commodity it also possesses (or is possessed by) an exchange value. Consider a spade with a gold handle and shaft. Its exchange value would be greatly vaster than a normal spade but not because of any difference in utility between the two. This exchange value haunts the commodity but can never really be pinned down to particular existing qualities. (Much of contemporary art might illustrate the conundrum well.) The ghostly presence of this value is certainly real but it cannot be ascribed a definite place within ontology. Its presence is best detected through hauntology. Derrida engages in an extended discussion of Marx’s illustration of the commodity character of a table. Whilst the table is basically matter, it is also at the same time an immaterial object in a way that suggests a form of animism: “The wood comes alive and is peopled with spirits: credulity, occultism, obscurantism, lack of maturity before Enlightenment, childish or primitive humanity. But what would Enlightenment be without the market? And who will ever make progress without exchange-value?” What Derrida is getting at here is that all of these superstitious beliefs or practices are part of the mechanism of capitalism itself. Whilst the free market is always described in clinical, economic terms that suggest a post-Enlightenment degree of scientific rigor, the actual motivations behind exchange rely on superstitious projections about desire, happiness and fulfillment. The ghost that haunts capitalism is the very pre-Enlightenment credulity that it appears to have exorcised. To put it in clear terms: is a world in which a Mark Rothko painting sells for $86 million a more rational world than one in which a system of kingship is operational? The point being that the present, however it is constituted, can never escape from certain irrepressible drives that will always intrude as ghostly agents. The apparent scientism of the market belies the primitive drives that animate it. What hauntology demonstrates is that our conception of the dead has progressed a stage further. It would appear that in order for us to engage with the dead now it is necessary to become like them. Hauntology represents an ontological erasure of the dead, but also of the living as well. By extending the concept of the spectral to all notions of exchange we universalize the principle that the ghost is the motor within otherwise dead matter. When we look at a photograph of a deceased relative we feel that they still in some partial way exist for us. The photograph is a mere object of paper and light sensitive chemicals but in some way the presence of the dead haunts it. But who is it who is witness to this haunting? It is precisely the hidden being behind things, the animating presence, the ghost in the machine. This insubstantial self attaches itself to things, whether human or otherwise, and we experience all meaningful interaction within the “insubstance” of this self; a hauntological discourse amongst equally spectral entities. So, the ancient conception of the dead involved their continuing to exert agency from beyond the grave and in this sense standing amongst the living as their equals. Now we are entering a phase where the living are mere hauntological shades, co-existing with the dead in their insubstantiality. Two very different states of equality. The story of the dead is a revealing tale of the way in which we view ourselves, and our current self-image is not flattering. In fact, like an undead vampire, when we look in the mirror there is no reflection to look back at us. There is some suspicion amongst Marxists regarding the legitimacy of Derrida’s hauntological theorizing. For instance, Terry Eagleton perceives a duplicity of approach in Specters of Marx: “For what we have in this text, by and large, is a political discourse of an averagely-intelligent-layperson kind, and a philosophical rhetoric, of spectrality and the messianic, which is at once more subtle and a good deal less convincing. The two registers subsist cheek-by-jowl without ever adequately interacting; the former committed yet rather crude, the latter exciting yet evanescent.” It may well be a perceptive criticism, as hauntology has taken on a life of its own which seems to have distanced it from its Marxist origins. Much of the interest in hauntology now seems to circulate around an interest in the idea of lost futures; the notion that the mid to late 20th century seemed to be pointing towards particular versions of a technological future, but that those versions have now been abandoned. This is why futuristic music of the seventies and eighties can now sound so dated: it was invoking a future that never arrived. Similarly with science fiction films which now look amusingly kitsch in their futuristic depictions of a space age future. Much that passes for hauntology now consists of music that nostalgically samples or references certain outmoded sounds in order to establish a sense of an atemporal present. This has a real resonance because of the ubiquity of all past media now living a virtual (spectral) existence online. The ghosts of past nostalgias are evoked so that they can come back to life in a present that seems at once omniscient and at the same time deeply bereft; in fact, in mourning. But within this process of mourning it should be noted that the spectral equality apparent in the rehabilitation of once lost forms can never be maintained as a formal equality. This is because nostalgia is mobilized as the primary motivating factor, and nostalgia is a very personal, very intimate emotion. Somewhat like sexual attraction, it cannot conform to pre-programmed notions of how it should behave; it is irrepressible. And, just as sexual attraction is the drive that guarantees the continuation of the lineage into the future, so mourning is the process whereby the lineage of the past is taken care of. These impulses are primary and will override abstract ideals. If the present time gives us the equality of opportunity to choose our ghosts, it is self-evident that ancestor worship will begin to re-emerge into our future. 1. Stephen Pollington, Anglo-Saxon Burial Mounds: Princely Burials in the 6th and 7th Centuries (Norfolk: Anglo-Saxon Books, 2008), 235-6. 2. Hilda R. Ellis Davidson, “The Hill of the Dragon: Anglo-Saxon Burial Mounds in Literature and Archaeology,” Folklore 1950 61(4). 3. William A. Chaney, The Cult of Kingship in Anglo-Saxon England: The Transition from Paganism to Christianity (Manchester: Manchester University Press, 1970), 130. 5. Catherine Belsey, “Shakespeare’s Sad Tale for Winter: Hamlet and the Tradition of Fireside Ghost Stories,” Shakespeare Quarterly 2010, 61(1). 6. M. R. James, Collected Ghost Stories (Hertfordshire: Wordsworth Editions Limited, 1992), 73. 10. Stephen King, The Shining (London: New English Library, 1977), 175. 11. Jacques Derrida, Specters of Marx: The State of the Debt, the Work of Mourning, and the New International (New York: Routledge, 1994), 190. 13. Terry Eagleton, “Marxism without Marxism,” in Michael Sprinker, Ghostly Demarcations: A Symposium on Jacques Derrida’s Specters of Marx (London: Verso, 1999), 85. This essay will appear in a collection of Christopher Pankhurst’s writings due out this year from Ravenshalla Arts.